This is an electronic version of the button- the buttons are being printed now! 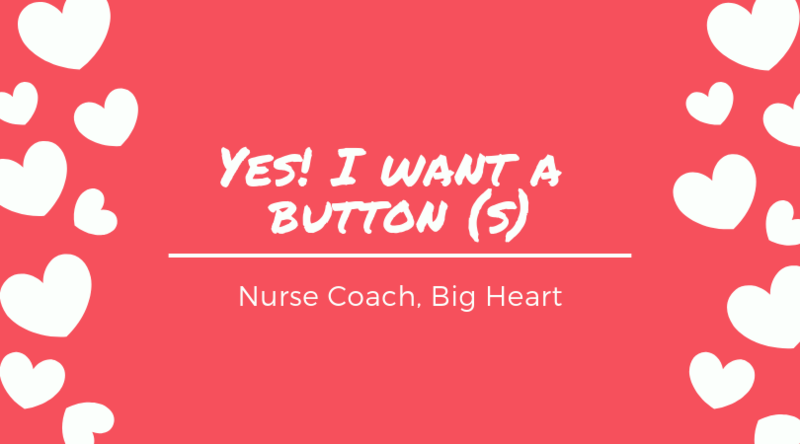 Show support for Heart Awareness all year long, and bring attention to Nurse Coaches around the nation by purchasing (and wearing) a Nurse Coach Big Heart button (which are made right here in the U.S.) for $5 + $1 shipping. Almost 100% of the proceeds will be donated to the American Heart Association in the name of Nurse Coaches. The American Heart Association has grown into a global organization, after being founded in Chicago, IL in 1926. It is committed to saving lives from cardiovascular disease. Heart disease is the leading cause of death in the United States and remains a leading cause globally as well. February is Heart Month, a time dedicated to raising awareness of heart disease, risk factors, and prevention. 24 Hour Window for purchase! Since this is a school project, you only have a 24 hour window to make your button purchases. Please follow the link to my page where you can enter your contact information and how many buttons you would like. To avoid any additional fees and so more dollars go to the American Heart Association, we will only accept check or cash payments.